Ever hear the old myth that if you put a frog in a pot and heat up the water slow enough, the frog won’t notice until it’s been boiled alive? Well, that’s not actually true, but it sure makes a great metaphor for what seems to be happening to Earth’s climate, according to the latest data from NASA and the National Oceanic and Atmospheric Administration. Unfortunately, we are all the frog. Both agencies performed independent analyses and found that 2015 saw Earth’s warmest surface temperatures since record keeping began in 1880. Last year’s average temperatures eclipsed the previous record year, which was — you guessed it — 2014. 2015 average temperatures. Yellows, oranges and reds represent areas where 2015 temperatures were above average. Believe me, I’m with you. Thanks to the ongoing and powerful El Niño, my region of the southern Rockies has been getting hammered with snow and frozen temperatures. But many believe that warmer oceans are fueling the phenomenon, and the data speaks for itself. 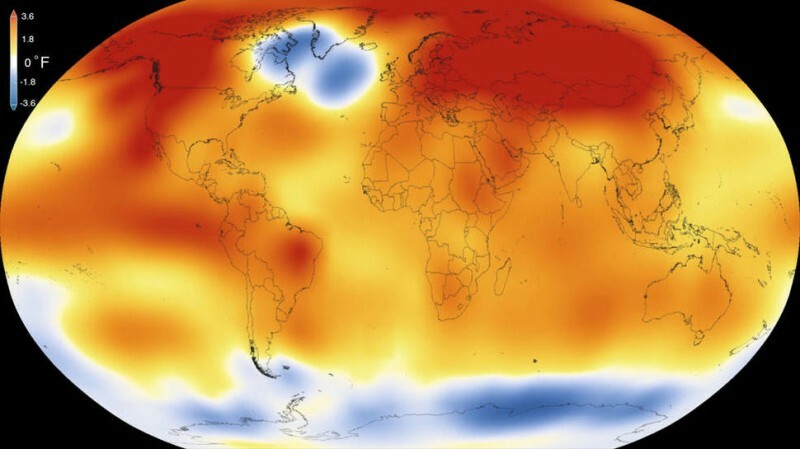 NASA says that 15 of the 16 warmest years on record have come since 2001 and last year was the first time that global averages were a full degree Celsius (1.8 degrees Fahrenheit) or more above the averages seen in the late 19th century. With most of the warming since 1880 occurring in the last 35 years, we literally live in a different, warmer world than previous generations. Both NOAA and NASA looked at data from 6,300 weather stations, ship- and buoy-based observations of sea surface temperatures. Globally averaged temperatures in 2015 shattered the 2014 record by 0.23 degrees Fahrenheit (0.13 Celsius). The last and only other time the new record was this much greater than the old record was in 1998. Could leaders at Paris summit find climate answers in space? NASA acknowledges there is some uncertainty in the accuracy of the weather station data and estimates that it is 94 percent certain that 2015 was the warmest year ever. You can get an idea of the long-term warming trend by watching the visualization in the video below. If we really are like that imaginary frog, and our planet is that gradually warming pot, it makes you wonder how soon we might want to “jump out” of the pot? Suddenly that Mars One mission is seeming a little less crazy.